Aspidistras are one of the, if not THE, oldest house plants. The common name "cast iron plant" was given because it seems to be able to take just about any conditions you care to give it. This particular plant used to live on my desk in the middle of the house, where the closest source of light was a western window about 10 feet (3 m) away and 'water' often meant 'stale coffee'. Low light levels will cause the variegation to turn a dull yellow or disappear entirely, and new leaves will be few and far between, but still...a great gift for a brown thumb. 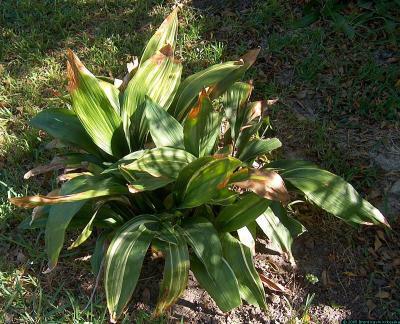 I now have a patch of Aspidistra in the middle of my south Texas yard where it gets 6 hours or more of direct sun and only God waters it (as of April 2008 we haven't had measurable rain for many months), and it looks pretty good. My best looking Aspidistras are potted, receiving mottled sun under an old ash tree, and weekly watering. The variegation turns to a beautiful bright white with dark green. New leaves grow from a stem that likes to lay on top of the soil. Burying the stem doesn't kill the plant, but does seem to make it grow slower and weaker. I left a small potted Aspidistra on the patio for a few months and encouraged my children (crumb-crunchers) to play around with it. The poor thing took everything they could do to it, and while it didn't grow, it didn't die either. It's now outside and doing fine.